Cryptomonadales, Crypto Chlorella, Chlorella Sorokiniana. Q: Why is Crypto Power Chlorella Superior to Any Other Chlorella Product? (1) Crypto Chlorella's 95% Digestibility and Absorption Rates. Anyone who is familiar with chlorella knows that chlorella's hard outer cell wall is the cause of its low digestibility rate. Until now, the best digestible chlorella pyrenoidosa on the market provided a digestibility rate (after being processed to break the hard cell wall) of 85% in about 5 hours after it was taken. However, the actual absorption rate (how much the body is absorbing its nutrients) was only about 73%. The wonderful news is that crypto chlorella is a soft outer cell wall chlorella; therefore it does not require its cell wall to be broken. Crypto Power Chlorella's digestibility rate is an amazing 95% in 1 to 2 hours after it is taken and the absorption rate is also nearly 95%! Less processing means more nutrition. A higher digestibility rate in a shorter period of time means more of Crypto Chlorella's nutrients are being absorbed into your body. In the first 2 hours after ingestion, crypto power chlorella delivers up to 25% more nutrients than any other chlorella product in the world. Any product is only as good as its ability to be used by the body. It's not the amount of nutrients you consume but the amount your body utilizes that makes the difference. (2) Crypto Power Chlorella's Chlorophyll and Phycocyanin content. (3) Crypto Power Chlorella's all natural PPARs content. (4) Crypto Chlorella's C.G.F. content. Crypto Power Chlorella contains CGF (Chlorella Growth Factor). CGF is not a single substance but contains a mixture of amino acids, vitamins, sugars and peptides particularly concentrated in the nucleic acids of RNA and DNA. Foods rich with nucleic acids are known to have anti-aging properties. * Crypto Chlorella's CGF (Chlorella Growth Factor) is a 100% pure nucleic acids extract. It has nothing else added. Crypto Power CGF comes in powder with 60 capsules (a 1 to 2 month supply). 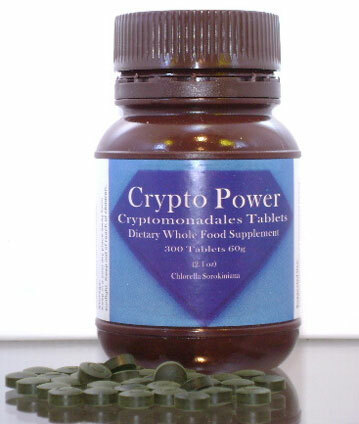 Crypto Power CGF will powerfully enhance your positive effects if taken along with Crypto Chlorella tablets or powder. Q: What is Crypto Power™ Chlorella? Cryptomonadales ® / Crypto™ Chlorella Sorokiniana. A: Crypto Power Chlorella (Cryptomonadales / Crypto™ Chlorella, chlorella sorokiniana) is a blue & green, thin soft cell wall, single-cell, fresh water algae with a unique array of nutrients. Each crypto chlorella cell is a self-sufficient organism with all of the plant's life functions taking place inside the cell. The result is an unusually abundant concentration of important nutrients in the plant. Crypto Power Chlorella provides you with important vitamins, minerals and other nutrients; many of which may be lacking in your daily diet. It is 50 to 60 percent protein, almost twice as much as soybeans and more than seven times as much as rice! What's more, Crypto Chlorella contains all the essential amino and fatty acids. And, it is one of the highest natural sources of chlorophyll (green pigment) and phycocyanin (blue pigment). Plus, crypto power chlorella contains an abundant variety of micro nutrients not found in any other chlorella strain, including significant amounts of natural alpha, beta and gamma PPARs Peroxisome Proliferator Activated Receptors. Q: Why should I take Crypto Power Chlorella daily? Q: Tell me about more about Crypto Power Chlorella's nutrients. A: Crypto Power Chlorella has more than 20 different vitamins and minerals; it is 50 to 60% high quality protein. Because of that, Crypto Chlorella is one of the highest natural sources of DNA and RNA. Taken daily, Crypto Power chlorella can help make you look and feel younger and healthier. * Also abundant in Crypto chlorella are chlorophyll, phycocyanin, iron, iodine, zinc, germanium, and it is rich in lysine, which is often lacking in our high-wheat diets. Some of the other nutrients found in Crypto chlorella are a full compliment of all of the essential amino and fatty acids, superoxide dismutase (antioxidant), various carotenoids, trace elements and more than 2,000 enzymes. Crypto Power Chlorella contains more vitamin B-12 than beef liver. Crypto chlorella is an excellent plant source of vitamin B-12 that is often lacking in many vegetarian diets. Finally, Crypto Power Chlorella contains an abundant variety of micro nutrients not found in any other chlorella or algae strain, including significant amounts of all three naturally occurring alpha, beta and gamma PPARs Peroxisome Proliferator Activated Receptors. Q: Can Crypto Chlorella replace my vitamin and mineral supplements? A: Crypto Power Chlorella is not a vitamin supplement. It is a whole food supplement. There is a big difference between the two. The actions of the individual nutrients a whole food supplement contains are different if they are not combined in natures own harmonious relationships. If just one of the nutrients is isolated and used for its known effects on the body (as in vitamin & mineral supplements), it will not have the same tonic effect as it will as a whole natural food. This is known as a synergism - the combination has a different and more enhanced effect than the individual component's would have. However, it does not mean that a product made with a combination of several isolated vitamins and /or minerals is considered as effective as a whole food supplement. Although a combination of several isolated vitamins and /or minerals may create some "synergism", they are still isolated nutrients, not whole food. Our bodies digest, absorb and utilize the nutrients from these isolated nutritional supplements far less than from whole food supplements. It is our opinion that you would be wasting your money on vitamin and mineral supplements, because more than a half of what you would be taking would simply be flushed right out of your body. Worse, some of these isolated nutrients could accumulate in your body burdening your liver and kidneys. Your body simply has a hard time recognizing nutrients in isolated vitamin / mineral supplements. Your body does recognize and utilize, to the fullest, the nutritional values from whole foods and whole food supplements. Unlike vitamin supplements, Crypto Power Chlorella is a complete whole food. The whole plant gives you the advantage of all the protoplasmic elements that aid in the growth and development of your cells. In fact, no other vitamin or mineral can ever replace the value of a whole food. Q: How does Crypto Power Chlorella compare with barley grass, wheat grass and alfalfa? A: Many "green" foods are good sources of chlorophyll, but by comparison, chlorella is the highest natural source of chlorophyll. The results of a laboratory test shows that chlorella has 5 times more milligrams of chlorophyll per serving than wheat grass, 12 times more than barley and nearly 50 times more than alfalfa. In fact, 2 to 3 % of chlorella is chlorophyll, the highest level of any edible plant. Chlorophyll cleanses your blood and builds up healthy tissues. * Plus Crypto Power Chlorella contains an abundant variety of micro nutrients not found in any other grass, chlorella or algae strain, including significant amounts of all natural PPARs Peroxisome Proliferator Activated Receptors. Q: Will Crypto Chlorella help me lose weight? Q: What is the difference between Crypto Power Chlorella's C.G.F. (Chlorella Growth Factor), and regular Crypto Power Chlorella tablets? A: Crypto Power Chlorella Extract C.G.F. (Chlorella Growth Factor) is a concentrated extract that comes from the nucleus of the plant where the nucleic acids DNA and RNA are found. Chlorella Growth Factor is extracted nucleic material from Crypto Chlorella. The findings of Benjamin Frank, M.D. (in his research on the aging process) help you understand what C.G.F. (chlorella growth factor) can do for you. Dr. Frank believed that the loss of energy and physical deterioration associated with aging are due to the increasing breakdown of nucleic factors (DNA and RNA) that are necessary for healthy cell functioning. His recommendation consisted of a whole foods diet, specifically foods rich in nucleic acids. He believed that this kind of diet would encourage the rejuvenation of your body's own DNA & RNA, enabling it to utilize nutrients more effectively, detoxify more efficiently, repair itself more accurately and produce more energy. * Although he certainly made no claims of immortality, he did report that many of his patients looked and felt more youthful. Keep in mind that the fast pace of modern life, high stress, poor diet, junk food, drugs, smoking, alcohol abuse, pollution and various negative lifestyle factors common in our time hasten the breakdown of our DNA & RNA and immune systems, creating an unnecessary vulnerability. Since Chlorella extract C.G.F. chlorella growth factor does not contain any fat-soluble nutrients, such as chlorophyll, it should be taken regularly with Crypto Power Chlorella tablets or powder. For those who are going through treatments of a major illness or injury, those who are recovering from illness or injury, those whose immune system is compromised, we strongly recommend you take Crypto Chlorella extract C.G.F. chlorella growth factor along with the tablets or powder. Crypto Power Chlorella extract C.G.F. Chlorella Growth Factor is 100% pure C.G.F. It does not contain any other ingredients. Crypto Power chlorella Extract C.G.F. chlorella growth factor comes in convenient veggie capsule form. Q: Can I take Crypto Power Chlorella with prescriptions? A: Yes. Crypto Chlorella is a whole food and as such will not normally interfere with the functioning of your medicines, either prescription or over-the-counter. * However please consult you pharmacist and/or doctor concerning your use of prescription medicines. Note: Natural products should never be taken at the same time of day as prescriptions or over the counter medication. Please allow 2 hours between ingestion. Q: How much and how often should I take Crypto Chlorella ? A: Because Crypto Power Chlorella is a whole food, you can enjoy large quantities without harmful effects. Crypto Chlorella can be taken once a day or several times a day, before meals or on an empty stomach. But it is always better to start with 2 to 3 tablets per day and gradually increase the number. One rounded measuring teaspoon of crypto chlorella powder is equivalent to 15 tablets. Most people take 10 to 20 tablets per day to maintain good health. You may add 1 to 2 capsules of Crypto Power Chlorella extract C.G.F. Chlorella Growth Factor a day for extra benefits. When combating illness or recovering from trauma, please consider taking 25 to 30 crypto chlorella tablets per day plus 2 capsules of Crypto Power Chlorella extract C.G.F. (Chlorella Growth Factor). Once you reach the full dosage (15 tablets), you may feel improvements right away, or depending on you body constitution and lifestyle factors, it may take up to 6 months until you start seeing good results. The longer Crypto Chlorella is taken daily the more benefits should be enjoyed. Please remember that good health is your responsibility. Taking Crypto Power Chlorella daily should be a part of your overall plan to improve and maintain your own good health. Q: What is the cost of Crypto Power Chlorella ? A: Very reasonable. Less than the cost of a cup of your favorite gourmet coffee. A small price to pay for such long-term health benefits. We know that any product is only as good as its ability to be used by the body. It's not the amount of nutrients you consume but the amount you utilize that makes the difference. Whole foods like Crypto Chlorella ensure the highest level of digestibility and assimilation, 95% in the first two hours. has a 95% digestibility rate within two hours. (barely 70% in two hours). delivers up to 25% more nutrition in the first two hours than the leading chlorella product. Plus the nutritional content of Crypto Power Chlorella is the most varied and richest of any of the over 20 different strains of chlorella. Cryptomonadales ® / Crypto™ Chlorella, chlorella sorokiniana is the one supplement, we believe, which outshines anything else we've encountered for the past 25 years in our search for excellent products. It is absolutely "the best", and we strongly encourage adults and children, healthy or not-so-healthy, dogs, cats, fish and plants to take this great whole food daily. Crypto Power ™ distributors in the USA.